Bristol City team: Hamer, Ayling, Flint, Williams, Fredericks (Burns 55), Smith, Pack, Robinson (Reid 57), Bryan, Wilbraham, Kodjia (Agard 71). Subs. O'Leary, El-Abd, Little, Wagstaff. Leeds United team: Silvestri, Wootton, Bellusci, Bamba, Taylor, Adeyemi, Phillips, Byram (Berardi 83), Dallas, Antenucci (Mowatt 65), Wood. Subs. Turnbull, Cooper, Murphy, Erwin, Doukara. For the midweek trip to Bristol City, United head coach Uwe Rosler made three changes from the 0-0 draw at Reading three days earlier, handing starts to Scott Wootton, Giuseppe Bellusci and Mirco Antenucci in place of Gaetano Berardi, Liam Cooper and Alex Mowatt. As pre-warned by Rosler in his press conference ahead of the game, the hosts made a rapid start to proceedings and Sol Bamba was forced into a crucial clearance inside the opening two minutes, heading behind a dangerous-looking cross from Joe Bryan. A period of end-to-end play followed and a swift Leeds breakaway down the middle through Tom Adeyemi saw the midfielder inches away from being found in a glorious shooting position after exchanging passes with Antenucci out wide. The hosts then had their first sight of goal, Callum Robinson cutting inside from the left before firing well over Marco Silvestri’s bar. Adeyemi appeared to be covering every blade of grass at Ashton Gate and it was the midfielder who had the best of United’s early efforts as he headed Kalvin Phillips’ drilled cross over the bar. At the opposite end, Silvestri was called into action with a low save to keep out Jonathan Kodjia’s strike from inside the area, before Stuart Dallas hacked Aden Flint’s header off the line from the resulting corner. Silvestri was again alert to block out Joe Bryan’s effort at his near post before the City winger skied his second attempt. The hosts were enjoying the better of the chances but a swift United counter-attack presented Rosler’s side with a golden opportunity to break the deadlock, after onrushing goalkeeper Ben Hamer felled Antenucci inside the area as the striker looked to round him. Referee Gavin Ward had little hesitation in pointing to the spot and Antenucci dusted himself off to convert emphatically, sending Hamer the wrong way in front of the joyous travelling supporters. Sam Byram then saw his downwards header held by Hamer as United were buoyed by the opener, but City ended the opening 45 minutes strongly as Robinson was denied by Silvestri from point-blank range on the stroke of half-time. Both teams re-emerged unchanged from the break and the second half started in a similar vein to the first, with City quick to go into attack. Aaron Wilbraham turned strongly inside the area, only to see the legs of Silvestri deny his low strike. But another swift United breakaway resulted in the game’s second goal on 52 minutes, with Chris Wood netting his first for the club. Antenucci found his strike partner out on the right and Wood cut inside before firing an unstoppable strike into Hamer’s bottom corner to double the lead. It was counter-attacking football at its finest and Leeds suddenly looked comfortable with the two-goal cushion. 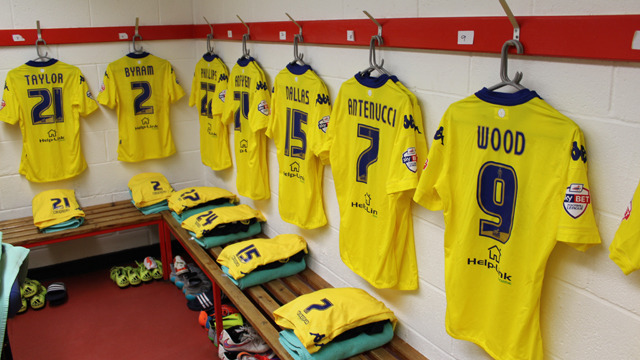 Rosler decided to make his first change of the evening on 65 minutes, replacing the excellent Antenucci with Mowatt. City had half chances through Wilbraham, just failing to connect with substitute Bobby Reid’s left-wing cross, and Derrick Williams, smashing a long-range free-kick harmlessly over the bar. The hosts managed to pull one back and ensure a nervy finale as substitute Kieran Agard fired in off the near post from inside the area with just one minute remaining of the 90. Six minutes of extra-time were added on and Steve Cotterill’s side made them count, with Flint scrambling in a last-gasp corner from close-range to ensure the spoils would be shared. LUTV: Click here to join Thom Kirwin and Eddie Gray at Ashton Gate for full match commentary on Leeds United TV.